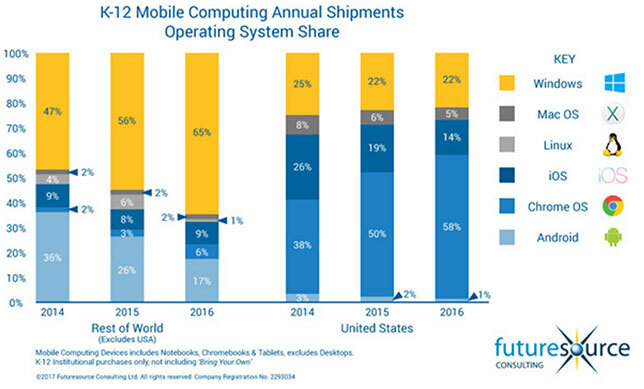 Google's Chromebooks gained a majority share of the K–12 mobile device market in the last year, pushing back Apple's iPad even further, while Microsoft Windows devices held steady in second place. Overall, the K–12 mobile device market saw double-digit growth in device shipments. As FutureSource reported: "The strong combination of affordable devices, productivity tools via G-Suite [formerly Google Apps for Education], easy integration with third party platforms/tools, task management/distribution via Google Classroom and easy device management remains extremely popular with US teachers and IT buyers alike. The rise of Chromebooks has also set new industry benchmarks with regards to average device pricing, with prices reaching as low as $120 on certain projects." Microsoft Windows held steady in second place with a 22 percent market share. FutureSource noted that several developments from Microsoft could portend stronger performance int he coming year. "Microsoft has made huge strides in developing its education ecosystem offering in the past year, with major announcements on both the devices and platform side. To date however, these developments have not stopped Google's momentum within the US K-12 market. Microsoft continues to face challenges to win back end-user mindshare. Chromebook users and administrators continually refer to the simplicity and ease of use of the platform. With rumors swirling in the technology press (not confirmed by Microsoft) about a potential new OS offering 'Cloud OS,' a stripped back, simplified OS, designed specifically for cloud with education in mind, would 'square the dots' on other recent moves Microsoft has made in education (in particular launching $189 devices)," said Mike Fisher, associate director of education at FutureSource Consulting, in a prepared statement. Further, FutureSource reported: "Microsoft has also had a suite of ecosystem developments, including the launch of 'Microsoft Classroom', 'School Data sSync' and a large number of integrations with popular third party solutions. More recently, Microsoft and partners announced a suite of Windows 10 based devices targeting the sub-$300 price point (devices designed to compete directly with Chromebooks), at the BETT show in London in January. Microsoft specifically announced partner devices that would price at $189, highlighting how Microsoft has been working hard to ensure the price advantages traditionally seen by Chromebooks will be limited or negligible. In addition, Microsoft has moved to close a significant benefit of Chromebooks, the central, cloud-based device management platform. Microsoft has announced 'InTune' for Education, a tool that effectively replicates the Google Management Console and allows IT admins to easily provision and set up large numbers of student devices remotely. It is also identically priced at $30 per device." Apple's iOS remained in third place behind Microsoft for the second year running, and macOS slid even further. This is the first time in FutureSource's reports that Apple's combined iOS and macOS shipments were behind Microsoft Windows. iOS shipments in 2016 accounted for just 14 percent of the overall market, down from 19 percent the prior year, and macOS slid to a 5 percent share, down from 6 percent the prior year. Overall, device shipments to schools grew 18 percent in 2016 to 12.6 million units, up from 10.7 million the prior year. (That's about one device for every four students in the United States.) FutureSource said it expects to see continued double-digit growth in 2017.